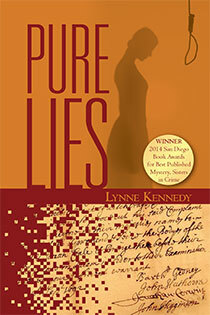 Awards: Pure Lies was a finalist in Amazon’s Breakthrough Novel Awards of 2014. Winner, San Diego Book Awards, Best Published Mystery, 2014. Two women, separated by three centuries, are connected by a legacy of greed, depravity and deceit–a legacy which threatens to make them both victims of the Salem witch trials. 1692, Salem, Massachusetts Born in a time and place of fierce religious fervor, 16-year old Felicity Dale has only endless church meetings and the drudgery of chores to look forward to. When her friends begin accusing neighbors of witchcraft, she fears the devil is in Salem. By chance, however, she discovers that the accusations of her “afflicted” friends are false. What had begun as a youthful diversion has been twisted through seduction and blackmail by powerful men into a conspiracy for profit. Nineteen people will pay with their lives. Today, Washington, D.C. Maggie Thornhill is a renowned digital photographer in Georgetown who possesses a passion for history. As her Ph.D. dissertation, Maggie takes on a project to electronically archive the original documents from the Salem witch trials. She observes discrepancies in the handwriting of the magistrate’s signature on certain land deed transfers — land that belonged to the witches. When a professor studying the documents is murdered, she begins to suspect that the trials and hangings were a result of simple mortal greed not religious superstition. Here’s what the ABNA Publishers Weekly Reviewer said: “A professor’s mysterious death is linked to the Salem witch trials of Puritan Massachusetts in this passionate, highly readable thriller that takes place in two distinct time periods. . .